Many complain that the city has reached the limits of its capacity to receive tourists, but a research study commissioned by the government indicates that, although the region faces “capacity issues”, it could have received more visitors last year. According to the study, which aims to determine the optimum number of tourists that Macau could receive per day, the region had the annualized capacity to host between 32.62 and 33.70 million visitors in 2014. According to the Macau Government Tourist Office (MGTO), the total number of visitor arrivals in 2014 was 31.5 million a 7.5 percent increase compared to 2013. The office predicts that annual visitor arrivals will grow by 5 percent in 2015. The IFT study, mentioned this week by Chui Sai On during the Policy Address presentation, was commissioned by the Secretariat for Social Affairs and Culture to the Institute for Tourism Studies (IFT) and presented yesterday. It includes several recommendations that aim to enhance Macau’s tourist capacity in the long run. “It is important that the physical capacity growth of key infrastructure and facilities is coordinated, balanced, and synchronous. Additional room capacity provided by recent (and upcoming) new hotel properties, for example, will not prove efficient if there is no corresponding increase or enhancement in other areas such as public transport and improvements in service quality,” the study reads. Leonardo Dioko, director of IFT’s Tourism Research Center, said that the tourist capacity has adjusted over time. “More hotels are being built but over the years, what we have observed is that there has been a slowdown, so we have reached a saturation point. It seems both residents and tourists are having negative experiences,” he pointed out on the sidelines of the presentation. “We are not saying we should cut tourism altogether, everybody is free to visit. What we can do is organize promotional actions in order to influence the visitors [and let them know] about the best time to come. We can plan and coordinate all the tourist events in order to manage the rate of visitations,” he added. In order to reach that goal, Leonardo Dioko said that more has to be done to schedule events more evenly throughout the year and during each day, in order to distribute demand. The study’s estimate of an optimum number of visitors is based on two key concepts, namely the social carrying capacity (SCC) and the physical carrying capacity (PCC). The first uses “subjective measures perceived and experienced by residents and visitors” such as perceived level of crowdedness, satisfaction with the quality of the environment, satisfaction with transportation services, service quality, satisfaction with tourist attractions and satisfaction with border immigration clearance. The physical carrying capacity evaluates the physical and service carrying capacities of eight major tourism-related infrastructures and services, including hotel accommodation, restaurant and dining facilities, public buses, taxis and major non-paid visitor attractions. Regarding SCC’s approach, the study suggests that the region’s capacity to absorb visitors may have reached a saturation point in 2014. “From a social perspective, this is likely due to residents beginning to grow weary of the effects of continued tourism growth on important quality of life issues, such as deteriorating experience with public transport and perceived overcrowding in the street, as well as deterioration in visitors’ travel experience caused by over-crowding and a possible decline in tourism service quality in F&B and retail outlets, as well as immigration borders,” it reads. 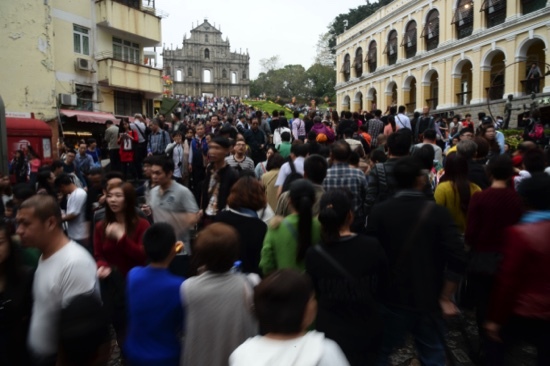 Concerning the physical carrying capacity, the IFT study points out that several tourism services and facilities were able to increase their capacity to service visitors in 2013 and 2014, but there were also setbacks like a sub-optimal number of hotel rooms, and capacity issues affecting Macau’s major visitor attractions and restaurants during peak periods of the year.